Axl Rose can sure hold a grudge. 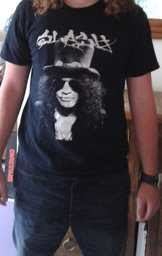 It’s been more than 16 years since Axl last spoke with Slash, but the NME reports Guns N’ Roses current line-up's management team have taken extreme steps to distance themselves from their classic version, by banning anyone coming to their UK tour from wearing a Slash t-shirt. During the band's gig at London's O2 Arena on Thursday, an NME source noticed that a member of the crowd was bare-chested under his jacket. When asked why, 18-year old James Revell said he was told to remove his top because no one was allowed in wearing a Slash T-shirt. The source then asked security if this was the case and was told by a member of the venue's team: "We were told by the management not to allow anyone into the O2 Arena who is wearing a Slash T-shirt and we are asking anyone who is to remove it and if they refuse they will be turned away." Speaking to NME on Friday about his ordeal, Revell described what had happened. He said: "I felt very angry because I was looking after my little brother at the time and felt as though my freedom to wear what I want had been taken away from me, however i did not react angrily as I didn't want to spoil the show for him." However, the show was spoiled for Revell due to Axl’s continued insistence on disrespecting his fans by intentionally being late on stage for every show. "I have never experienced anything as insulting as that at a concert before and I had to sit there in my little brothers jumper and wait for Axl to turn up well over an hour late, which we could only stay to watch 3 songs as we had to catch a train back. I think that Axl Rose doesn't appreciate his fans or anyone for that matter, he needs to grow up and stop acting like a child."